The story of the family of Jacoby and Berta (née Grunbaum) Seckel contributes much to our understanding of the dynamics of the small city of Themar in the late 1800s/early 1900s. 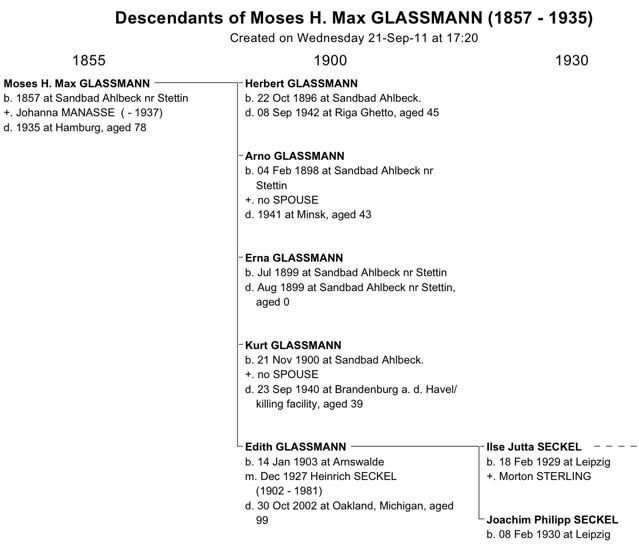 We learn more about one of Themar’s major Jewish families, the Grünbaums, members of which were in Themar from the beginning in the late 1860s/early 1870s until the end of the Jewish community in the Holocaust. It tells us how the rapid growth of the Jewish community from its beginnings in the late 1860s was the result of the in-migration of Jews from other communities rather than natural increase. We learn more about the internal dynamics of Themar’s economic structure: how Jewish businesses were established, closed, and/or passed into the hands of other family members. Within a larger context, the family’s story contributes to our knowledge of why and how many German families — Jewish and non-Jewish — either moved from small urban centres to larger and still larger ones in search of economic prosperity, or left Germany altogether. And, with particular reference to the experience of Jewish families during the Holocaust, the story of the Seckels highlights the strategies families pursued in order to escape the Nazi terror. In so doing, the story challenges some long-standing assumptions about Jewish Germans — such as the belief that older Jewish Germans resisted or refused to consider emigration. Bertha Seckel, née Grünbaum, date unk. Source: Yad Vashem, Page of Testimony, submitted by Bertha’s granddaughter in 2009. 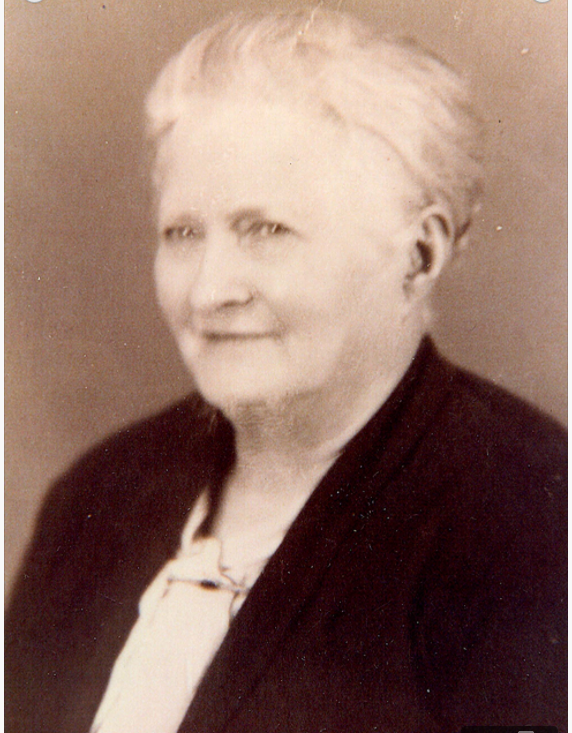 Bertha Seckel, née Grünbaum, was born in 1867 in Walldorf in Thüringen, a centre with a population of approximately 1600 in the mid-1800s. Her parents, Loeser (b. 1839) and Johanna Grünbaum (b. 1894, née Bergmann), moved to the slightly larger centre of Themar — population about 1800— sometime after 1870; her father, Loeser Grünbaum, set up a store on the marketplace, the city’s economic centre. There were other Grünbaums in Themar but the exact connection to Bertha’s family has still to be sorted. The family of Noah & Minna (née Friedmann) Grünbaum also came from Walldorf/Thüringen sometime after the birth of son Hugo in 1868 and before the birth of daughter Minna in Themar in 1872. Noa Grünbaum (b. 1841) may have been either Loeser’s brother or his cousin. Minna Grünbaum, Noah’s first wife died in 1872, and Noah remarried. In 1876, he and Josefine, his second wife, had a son, Karl. Bertha, Hugo, Minna and Karl Grünbaum probably all attended the public school in Themar, which at that time was located near St. Bartholomew’s church. As well they received instruction from the Jewish Lehrer, Hugo Friedmann. 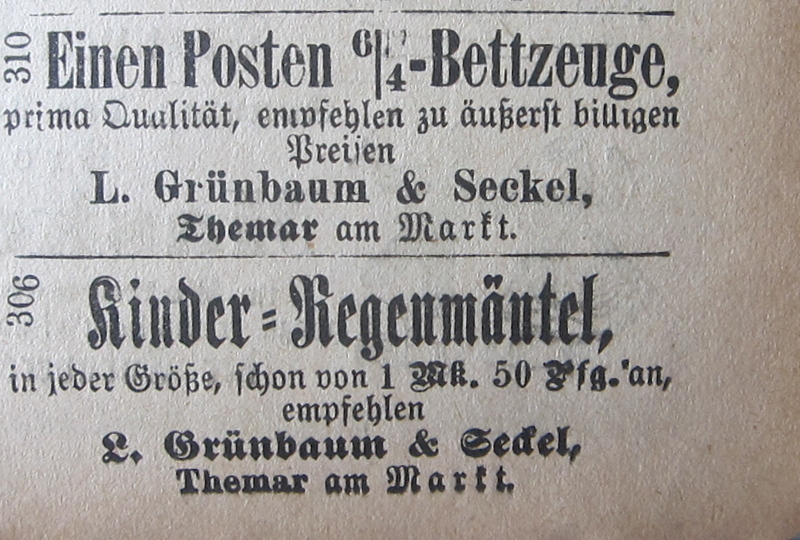 Ads for the joint enterprise of L. Grünbaum and J. Seckel on the marketplace in Themar. Source: Zeitung für Themar, 1891. In 1890, Jacoby Seckel and Bertha Grünbaum married in Themar; Jacoby joined his father-in-law, Loeser Grünbaum, in the business on the Market Square. He also became active in the religious life of the Jewish community and was one of the Gemeinde’s governing committee by the turn of the twentieth century. Between 1891 and 1904, Jacoby and Bertha had six children in Themar — we know details of the lives of five of them, but of the eldest, Alfred, b. 1891, we know little other than his name. It is possible that he died young. The Seckel family left Themar in the first decade of the twentieth century, probably seeking greater economic prosperity in a larger centre. Loeser Grünbaum, Bertha’s father, died in 1904, and, in the spring of 1905, Jacoby Seckel, age 45, sold the business to Hugo Grünbaum, related to him by marriage. A huge ‘going-out-of-business’ sale ended on 1 April 1905. 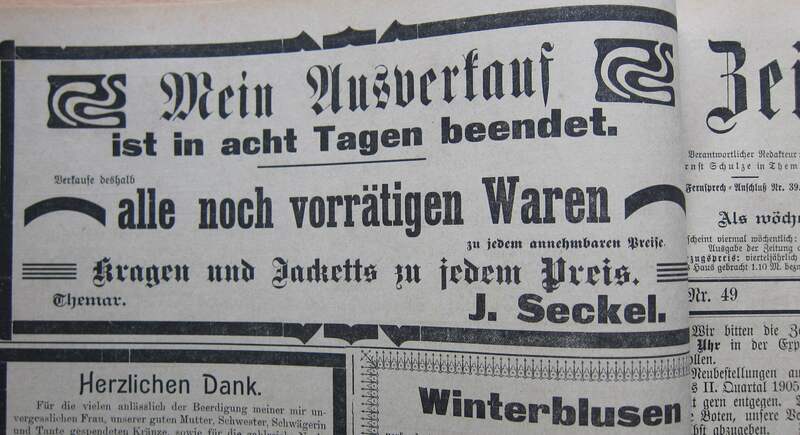 “Only 8 days left in Sale” Zeitung für Themar, 1905. City of Themar Archives. 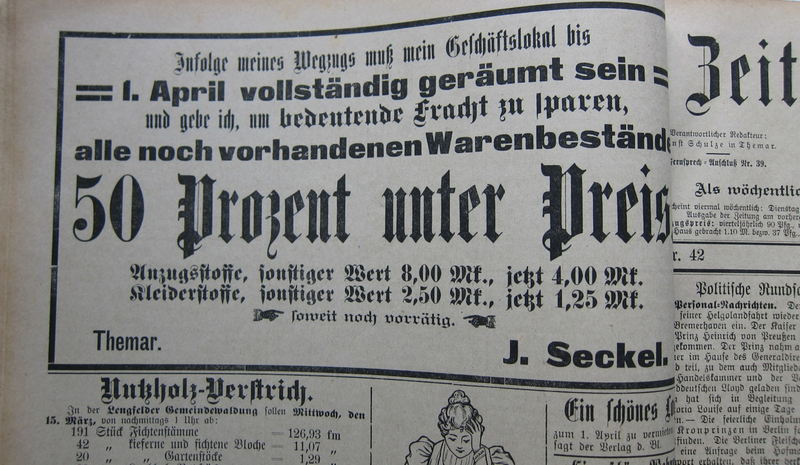 Ad for sale “on occasion of Business Closure and Move.” Zeitung für Themar, 1905. City of Themar Archives. The family left for the city of Zeitz in Saxony-Anhalt. Situated about 40 km south-west of Leipzig, Zeitz was a city 10 times the size of Themar — about 33,000 citizens in 1910 — although its Jewish community may have been no larger than Themar’s. Death notice for Lottchen Seckel in Themar newspaper. Presence of Christian cross in Jewish death notices was a frequent occurrence. Source: Zeitung for Themar, 1906, Themar City Archives. In 1906, their 20-month old daughter, Lottchen, the last child born in Themar, died in Zeitz. Bertha’s and Jacoby’s roots were still so deep in Themar that they placed a notice in the local Themar newspaper. Their last child, a girl, Gertrud, was born a year later. In 1909, the Seckels moved again, this time north to Altenburg, a city of app. 40,000 citizens, of whome 156 were Jews. They lived at Rossplan 5, and for two years, Jacoby continued his Kolonialwarengeschäft. But, on 12 January 1911, Jacoby Seckel died, 49 years old. As with all family news, Bertha immediately let her friends and relatives in Themar know. The outpouring of sympathy prompted Bertha to place another notice in the Themar paper thanking everyone for their condolences. In 1911, therefore, 44-year-old Bertha, was a widow with 4 children under 20 years of age. Bertha did not return to Themar; instead, she remained in Altenburg, raised her family and continued the family business. It is possible that her mother, Johanna Grünbaum, née Bergmann, had moved to Altenburg before 1911. But if not, she probably joined her daughter in Altenburg shortly after Jacoby’s death in order to help raise the children and allow Bertha to continue the business. The family moved into Rossplan 2 and 3 and, on 27 November 1911, Bertha registered the Kolonialwarengeschäft in her own name in Altenburg’s Commercial Register. The Seckels always let the Themar community know of the deaths within the family: Lottchen in 1906, Jacoby in 1911 and Johanna Grünbaum in 1912. Source: Zeitung für Themar, 1917, Themar City Archives. 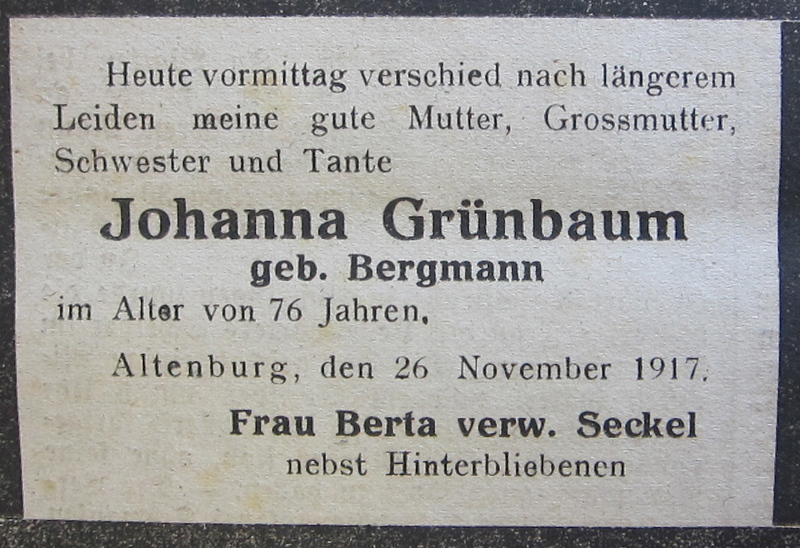 Johanna Grünbaum died in November 1917, just as the Seckel children were about to form their own families. In 1919, two Seckel sisters married two Wohlgemuth brothers: on 27 May 1919, Klara Seckel, b. 1893, married Max Wohlgemuth. Six months later, Hilda, b. 1895, married Max’s elder brother, Emil (b. 1889). Two years later, Sophie Seckel, b. 1897, married Frederich Fernich, b.1893 in Klotten/North Rhine Westfalen. The Seckels left Altenburg in the early 1920s; address and telephone directories of the 1930s help us to know who lived where when until the late 1930s. Bertha moved to Leipzig, home to some 700,000 citizens, of whom over 12,500 were Jews. She lived at Kohlgartenstraße 38 and Gertrud probably lived with her until her marriage to Alfred Münzer. We can slso find Klara, Sophie and Heinrich in Leipzig, all living within the Waldstraßenviertel: Sophie and Frederich Fernich at Brühl 29; Heinrich Seckel, his wife, Edith, and two children first lived at Körnerstraße 7 and then moved to Waldstraße 72; Klara and Max Wohlgemuth first lived at Richard Wagner Straße 8 and then moved home and business to Leplaystraße 10. Only Hilda’s whereabouts in the 1930s are elusive: the few Leipzig address books available online do not include an entry for Emil Wohlgemuth, suggesting that they they lived elsewhere. Hilda and Emil divorced in 1932, and Emil was living in Berlin in the late 1930s. Where Hilda was is not yet known. By mid-June 1938, if not before, the Seckels were seeking to emigrate: according to his daughter’s account, Heinrich travelled alone to the United States in June 1938 to seek sponsors for his family. He returned and was in Leipzig on the night of the Reichspogromnacht/”Kristallnacht’. The clothing store was burned and Heinrich was imprisoned in Dachau. On 23 December 1938, after his release from Dachau, Heinrich Seckel registerd the addition of the namees ‘Israel’ and ‘Sara’ for family members directly connected to Themar living in Leipzig: for himself and his two sisters, Klara and Sophie, who had been born in Themar, and for his mother, who had been married in Themar. Between fall 1938 and July 1941, eight members of Bertha’s immediate family escaped: three daughters, son Heinrich, two sons-in-law and three grandchildren. First to leave was Alfred Muenzer, husband of Gertrud; he left in early November 1938 — that is, before Kristallnacht/Reichspogromnacht — for the United States and lived in New York City, awaiting Gertrud and daughter Ingrid Dorothea. In August 1939 — just before WWII began — Heinrich Seckel left for England. His task, like that of so many other Jewish Germans who immigrated into England at that time, was to make arrangements for family members to follow and then to move on elsewhere. Although successful in the long run, Heinrich was unable to bring his family to England before war started. However, he also avoided being sent to Canada or Australia as ]=an ‘enemy alien’ in May 1940, and immigrated into the United States on 29 July 1940. Wartime conditions made escape doubly difficult but not impossible: Sophie and Frederich Fernich were able to leave Europe from St. Nazaire, France, on 19 May 1940, just weeks before Germany took control of France. A year later, on 22 May 1941, when time was running out fast, Gertrud Münzer, née Seckel, left Lisbon with her six-year-old daughter, Ingrid Dorothea. Only in early July 1941 did Heinrich Seckel’s wife, Edith (née Glassmann) and their two children, Joachim-Philipp and Ilse, sail on one of the very last ships to carry refugees from Europe. They joined Heinrich in Dainesville, Ohio. Again, as with her whereabouts during the 1930s, Hilda Seckel’s story is unclear. Almost by chance, we learn that she was in Leipzig in May 1940; her sister Sophie identifies Hilda Wohlgemuth as the point of contact on the Fernichs’s immigration papers into the United States. Then official California records tell us that Hilda lived in California and died there in 1988. But what happened between 1940 and 1988 is still a mystery. Records in the Jewish Transmigration Bureau files tell us that Sophie Fernich tried to bring her mother, Bertha Seckel, to the United States. By February 1941, Sophie had paid the monies required to guarantee financial security for her mother’s immigration into the United States. But Bertha’s number in the American quota list was too high; in October 1941, when the German authorities banned emigration from Germany, Bertha’s number had not come up and she was trapped in Germany. 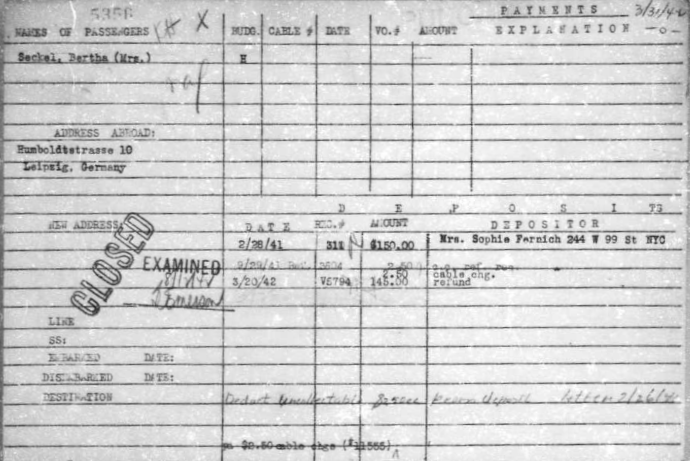 On 20 March 1942, the Americans closed the file and refunded Sophie her deposit. Klara too was trapped in Germany but the circumstances remain cloudy. We know that her husband, Max Wohlgemuth, either escaped before the Holocaust or survived it in some manner. In her book, Menschen ohne Grabstein (2001), Ellen Bertram states that he emigrated. It is possible that, like his brother-in-law Heinrich, Max left Germany first, hoping to be able to arrange for Klara to follow and the effort failed. He too came to the United States where he died in 1983. 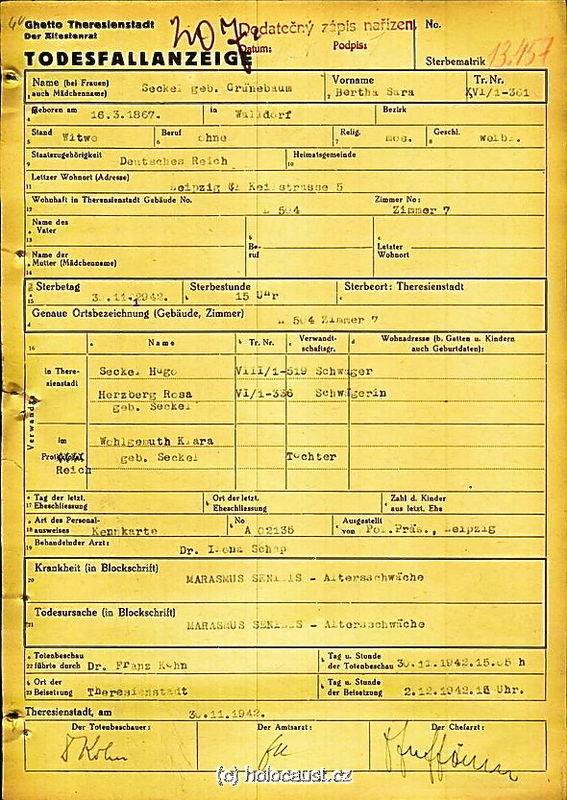 Bertha’s and Klara’s situation deteriorated steadily: in early 1939, Leipzig Jews were forced to move into Judenhäuser and records such as her file with the Jewish Transmigration Bureau (above) indicate that for the Seckels, the first of these was Humboldtststraße 10. 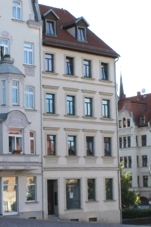 The immigration records tell us that Hilda, Gertrud, and Heinrich Seckel’s family also lived at Humboldtstrasse 10 in the time leading up to their emigration. Deportations from Leipzig began on 21 January 1942, but neither Bertha nor Klara was on the first transports. Klara probably avoided the 10 May 1942 transport to Belzyce Ghetto because her forced labour as a seamstress (furrier) was deemed essential. Bertha, age 75, was held back in May to be deported to the so-called ‘retirement ghetto’ at Theresienstadt in fall 1942. Death Certificate, Bertha Seckel, Theresienstadt Ghetto. Click to enlarge. .
As the combination of emigration and deportation reduced the number of Jews in Leipzig, those remaining were forced to move yet again. The available information is that Klara’s last address was Gustav-Adolf-Strasse 7 and Bertha’s Keilstrasse 5. Bertha was the first to be transported: on 20 September 1942, a transport — of over 800 Jews — took her to Theresienstadt Ghetto. Grünbaum relatives were on the same transport — Hugo Grünbaum and his wife, Klara, from Themar; Minna Rosenthal, née Grünbaum, from Apolda; and Karl Grünbaum and his wife, Hulda née Schlesinger, from Erfurt. From Bertha’s death certificate, we also learn that she arrived in Theresienstadt just as her brother-in-law, Hugo Seckel and his wife, Else, were being deported from Theresienstadt to Treblinka. Her sister-in-law, Rosa Herzberg, née Seckel, was also in Theresienstadt when Bertha arrived; whether Bertha knew any of this is impossible to know. Bertha Seckel, née Grünbaum, died on 30 November 1942, just over two months after her arrival. It is possible that Klara learned of her death. On 17 February 1943, Klara was rounded up with at least 116 other Leipziger Jews and taken to Berlin; on 26 February 1943, she was deported to Auschwitz. The German National Archives Memorial Book does not give an official date of death. In the United States, the Seckels initially lived in various states: the Fernichs lived in New York, the Heinrich Seckels in Michigan, Hilda and Gertrud in California. Heinrich died in 1981. Sophie joined her sisters Hilda and Gertrud to live in California and died there in 1983. Hilda, who married Siegbert Lippschutz (b. 1901 in Berlin), died in 1988; and Gertrud, the youngest of Bertha’s and Jacoby’s children, died in 2001. Of the many things the story of the Seckel family teaches us is that, despite subsequent moves and the passage of time, some members retained a strong attachment to the city. They did not forget Themar. Themar is now committed to ensuring that the memory of this family is honoured. Luckily, traces have been found in the City of Themar archives and Themar newspaper archives. Further critical information has come from the Pages of Testimony that Bertha’s daughter and son-in-law, and grand-daughter, have contributed to the Yad Vashem Central Database of Shoah Victims’ Names. Other researchers have provided additional information and so the story acquires layers and nuance. We welcome any further information. Please contact Sharon Meen @ s.meen79@gmail.com or smeen@mail.ubc.ca. The Nachkommenliste/Descendants List below identifies the members of Jacoby and Bertha Seckel who were born in Germany (or Europe) prior to 1945. Please see the page about Klara Seckel and her husband Max Wohlgemuth. ∞ Max WOHLGEMUTH, b. 1894 Pakość Poland, d. 1983 Los Angeles/Ca. ∞ Siegbert LIPPSCHÜTZ, b. 1901, d. 1987 Alameda/Ca. 1. Heinrich SECKEL, b. 23 Feb 1902 Themar, d. 1981 Oakland/Mich. 1. Gertrud SECKEL, b. 1907 Zeitz, d. 2001 Los Angeles/Ca. Many thanks to Christian Repkewitz of Altenburg for the information he has provided about the Seckel family when they lived in Altenburg. You will find his research about the Jewish community of Altenburg and a Stadtplan appear here. 1. The spelling of the family names — for example, Klara and Bertha — is based on documents which they themselves prepared. 2. Klara Wohlgemuth’s in-laws perished in the Holocaust. Her father-and-mother-in-law, Nathan and Fredericke (née Peritz) Wohlgemuth, were deported from Berlin on 31 July 1942, first to Theresienstadt and subseqently, on 26 September 1942, to Treblinka. Her brother-in-law (and Hilda Seckel’s first husband), Emil Wohlgemuth, was deported from Berlin on 29 January 1943, from Berlin to Auschwitz. German National Archives. Memorial Book online version. Leipzig Adressbücher, 1920, 1930, 1932, and 1936. Yad Vashem. Database of Shoah Victims’ Names. Pages of Testimony for Bertha Seckel, Klara Wohlgemuth, and Emil Wohlgemuth. Zeitung für Themar, 1900-1903. Themar City Archives.